I barely weighed 115 pounds when I got married. When I went shopping for wedding dresses, most of the dresses were in large stock sizes, so the sales clerk had to clip back the dresses with massive clips just to give me an idea of what each dress would look like. And then, in a stroke of genius, the sales lady offered to show me some dresses on the clearance rack — in smaller sizes. Back then, even a size 6 was a bit roomy for me, and I finally slid into a size 4 dress that actually fit me. No alterations needed. I am convinced I bought that particular gown more because it actually fit than because it was my dream dress. I had envisioned myself in a mermaid style number and instead walked away with a sequined tulle ballet-skirted gown. However, it was still beautiful, and we bought it on the spot. I didn’t get to try it on again until right before I was to fly down for our destination wedding. And then I noticed that my dress no longer fit like a glove. Either I had lost a few pounds sometime between when I had tried on the dress in the store or the underskirts they had given me with the dress did not fill it out as much as the sample slip I had used. Thus, I had a little extra room under the fabric in the back where the dress met my tailbone. The sales clerk assured me that that the space was so slight, it could be remedied with a fuller petticoat. The wedding was looming up in just a few days, so I took the dress as-is with the different petticoat. But, if the truth be told — even with the recommended skirts underneath, I still had too much room in the waist of the dress. There wasn’t anything I could do with the wedding upon me. I simply wore the dress, and probably no one other than me even noticed that it did not contour to every curve as it was designed to. But it still bothered me a little at the time. In looking back at my wedding dress dilemma, I have found that marriage is kind of like that wedding dress I wore all those years ago. Some days it fits better than others. It has taken some adjusting, some altering to fit into a life with someone who lived independently of me for the majority of his life. 1. Educate yourself on gender differences. You may be reading this thinking, huh? What is there to know? I got this! Let me assure you, from one woman to another, men have very different needs, communication modes and behaviors. Period. Even knowing this going into marriage, I still didn’t really get how these differences would crop up immediately. Some of our earliest fights occurred because I had no idea how to handle this man, this utter alien from outer space. I had grown up with three sisters and a fairly distant father. I had no reference point for how to interpret my husband’s actions. I found it helpful to read several books in my early marriage. A few that I really enjoyed were Staying Close: Stopping the Natural Drift Toward Isolation in Marriage, by Dennis and Barbara Rainey; Men Are from Mars, Women Are From Venus, by John Gray; and The Five Love Languages: The Secret to Love that Lasts, by Gary Smalley. We also benefited from joining a life group at church focused on couples and attending several couples’ events at church. I am still learning what makes my husband tick, but understanding that males generally have different things that motivate them and make them operate (including entirely different wiring in their brains) has helped me to understand Keith better and not expect him to have the same reactions to life events and conversations as me. 2. Get involved in a church community. As tempting as it is to run off together and never leave each other’s sight, you will have to come up for air eventually, and you need Christian community to support your marriage and help bring accountability and community into your life. I can think of several turning points in my early marriage — and two important ones I can think of are when we went to church for the first time together when we were first married, and when we found a home church once we got established in my husband’s home state. A Washington-born girl, I was extremely homesick when my then military husband was honorably discharged, and we made the decision to move permanently to Georgia. That homesickness began to fade once we got plugged into a good church. We both benefited from being part of a faith community where we could learn more about God and connect with other individuals in similar life stages (and in even more advanced life stages). We could know that we weren’t alone in some of the struggles we were having, and we could get advice and knowledge from couples further along in their life journey. Not only is it necessary to learn about gender-related relational differences, it is necessary to make sure your overall expectations are not creating an unrealistic standard for your spouse. The day before my wedding, my then future father-in-law gave me some sage advice regarding expectations: he told me to lower them! I thought at the time that the advice sounded a little odd. Why would I do that? And now that I have been married for some time, I have a better sense of what he meant. 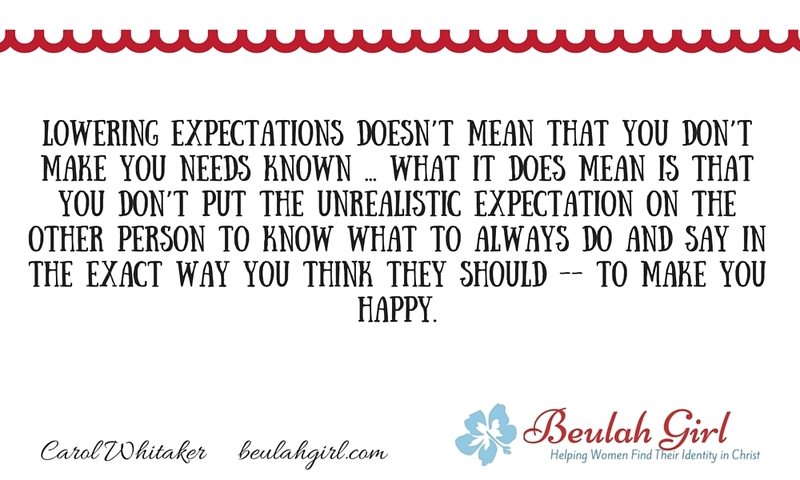 Lowering expectations doesn’t mean that you don’t make your needs known. It also doesn’t mean you pretend like you don’t have any needs or wants or allow someone to de-value or disrespect you. However, what it does mean is that you don’t put the unrealistic expectation on the other person to know what to always do and say in the exact way you think they should — to make you happy. I have long since discovered that my husband is good at a lot of things. We have many meaningful talks, and I tell him just about everything. But he often doesn’t have the reactions I think he should or always meet every emotional need I have. And I can’t expect him to. I remember after having my first baby, I was overwhelmed with the recovery, hormones, decisions, fear. I was having a hard time learning how to breast-feed, and I felt like a total failure. Everyone in my family breast-fed — my mom, my sister, but I absolutely hated it. I thought it was awful. I liked feeding my baby from a bottle better, but I was afraid to stop breast-feeding because I feared I wouldn’t be a good mom if I didn’t adhere to more natural practices. Enter in unrealistic expectations: I wanted my husband to understand my emotions, what I was going through. When I shared with him how I felt, he just shrugged and said, “Just use formula if you want.” End of discussion. I wanted him to understand what a big deal this decision was for me. In retrospect, I realize my husband was just reacting out of his reference point. I really needed the soothing experience of talking with other women who had gone through similar experiences. I get it. If my husband were unloading on me about a problem unique to men, I might have a hard time relating to it. The bottom line: Husbands can’t meet all our needs. We have a God for that. We can also benefit from other friendships that can help us in whatever life stage we are in. 4. Apply Christian principles in the home. In my first few years of marriage, I was in a bit of a backslidden state as a Christian. I was distrustful of certain Christian principles I had seen abused or misused in my own family or other families I observed. Although I knew about the biblical verses that instructed wives to submit to their husbands, I really didn’t feel that those passages applied to me. Wounded in two dating relationships prior to meeting my husband, I had concluded that I needed to stop being so needy and clingy. In an effort to protect my heart, I became very independent. I would make what decisions I wanted to, come and go as I pleased, and not act like I needed anything from him. As you can imagine, there was some friction caused by this self-sufficient attitude of mine. One Sunday, I went to church mad. I don’t remember if I had had an argument with Keith or what the problem was, but I had a list in my head of things Keith needed to do differently in our relationship. While I expected God to side with me — God ended up doing a work in me rather than my husband! During the course of the service, the Holy Spirit strongly convicted me and showed me a clear picture of what I was like to live with. And the picture wasn’t pretty. I felt I was to apologize to Keith for not letting him lead. It was difficult for me to humble myself and go to him and tell him that I had been wrong, but I felt a sense of peace and relief after that conversation. I came to the revelation during that incident that God designed marriage with specific roles in mind, and for my marriage to work the best way possible, I needed to obey biblical mandates. When I allowed my husband to take the role of leadership, I honored not only him but I honored God. I had more tranquility in my home and more in my soul when I obeyed what Scripture said about my role as a wife. Does submission mean I am a meek doormat who never gives an opinion or speaks up? No. I tell him what I think. I give him advice. I would never participate in a wrong action out of a false belief that that constitutes as submission, but from that moment I had in church where God made it clear that my attitude needed to change, I have made the effort to support him as the head of the family and let him determine what direction we will go in terms of our major decisions. 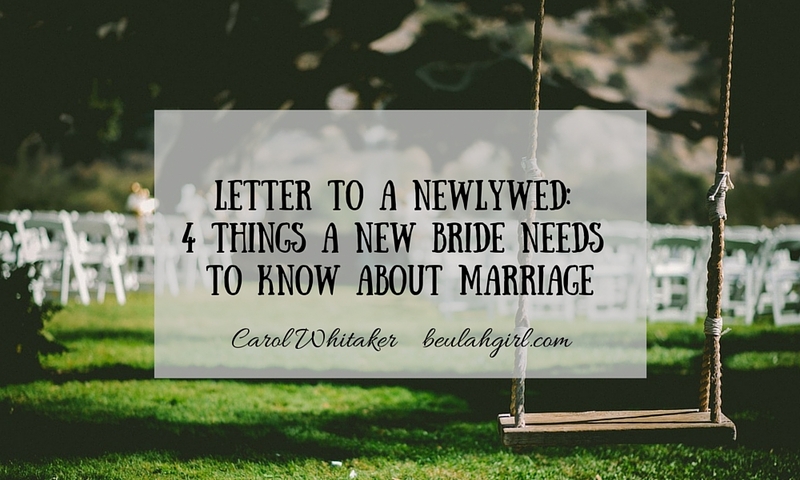 While there can be days where marriage feels just as ill-fitting as the waistline of the dress from my wedding day, the good thing about a marriage relationship is that it is flexible — it can grow as you grow. There have been moments where I have been so angry at Keith only to have other moments where I am so happy with where we are in our relationship. God cares about your relationship and knows the things you need to help make you thrive in it. Above all — seek Him, and you will find that the more you grow in your relationship with Him, the more you will know what things you can do to make your marriage “fit” better than it does now.